who is the heaviest licensed air pilot in the world. Transcribed by Bob Davis - 9-4-05 Boston, June 28. - A drop of 100 feet in a disabled biplane on the edge of a bank of treacherous quicksand bordering a big, muddy pool on the Dorchester marshes, was the exciting experience today of aviator Eugene Heth of Memphis, Tenn., on his flight as a graduated aviator and Edward Fleet, a mechanician. The two men were aloft at the Harvard aviation field at Squantum in a biplane owned by Louis Mitchel of Memphis. They were soaring nicely when the crankshaft on the biplane suddenly snapped. Then the machine shot down at a rate of twenty-five miles an hour. It sunk into the quicksand but Heth and Fleet were not injured and were able to escape. Note: Louis Mitchell was a well-loved aviator from a small town in a part of Arkansas very near Memphis. Transcribed by Bob Davis - 9-4-05 Louis Mitchell and Eugene Heth, aviators, arrived in Memphis last night from Chicago. Mitchell and Heth comprise the American Aviators Company and have been absent from Memphis since December. They have spent the summer flying in Illinois, Indiana, Wisconsin, Minnesota and Iowa. We think we have done well indeed, said Mitchell last night, “for we have not had a mishap and each of us only lost a day each owing to adverse weather conditions. Mitchell lays claim, and appearances support him to being the heaviest aviator in the game. He weighs 210 pounds. From here they will go to Montgomery, Ala., to fly the Alabama State Exposition, opening Oct. 21. They were at that place a year ago and carried twenty-four passengers in one afternoon without mishap to one. Mitchell has two Wright aeroplanes and a hydroplane with him. He will stage an hydroplane flight on the river Oct. 13 if arrangements can be perfected with the excursion boats to care for the crowds. Made Headquarters in Memphis and Was Well Known. Partner Also in the Air, Heth, From Far Above, Sees Mitchell Lose Control. Transcribed by Bob Davis - 9-4-05 Montgomery, Ala., Oct. 23. - Aviator Louis Mitchell, president American Aviators, while 200 feet in the air, lost control of his machine while making a spiral glide, and is dead. Mitchell had been circling the exposition grounds for more than an hour at varying heights. Shortly before 5 o'clock he began his descent in a spectacular glide. At 600 feet he lost control of his machine, and at 200 feet the aeroplane went to pieces. Mitchell was pinned to the ground under the heavy motor, dying before surgeons could reach the spot. Aviator Eugene Heth of Detroit, Mitchell's partner, saw the accident, together with a crowd of 5,000 spectators. Heth was above Mitchell with a passenger, and was about to descend in a spiral glide, following Mitchell. Mitchell had a start of several minutes, however, and Heth says, when Mitchell lost control of his machine he could see the ground between the two planes (wings) of the Wright machine. Mitchell's body will be taken to his home at Camden, Ark., tomorrow morning. His wife, who was present in the grandstand, did not see the accident. Transcribed by Bob Davis - 9-4-05 Montgomery, Ala., Oct. 23. - The death of Louis Mitchell came as a great shock to his host of friends in Memphis. Not since the death of the late John B. Moisant has an aviation accident caused such sorrow. 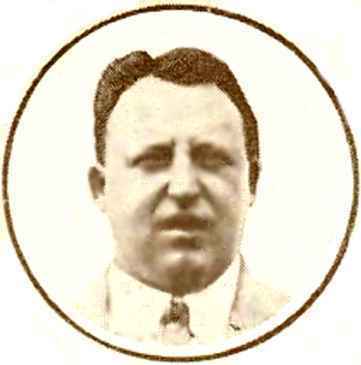 Mitchell was one of the most popular aviators in the game. Like most of them he has always had the feeling that some day his name would go down among the others sacrificed to the sport. Less than a week ago he gave a friend on the staff of The Commercial Appeal his picture, adding, "Some of these days I guess you'll run that with a story saying that another aviator has flown and died." Mitchell made a small fortune out of the motion picture industry. He came to Memphis nearly ten years ago and started a film agency. He prospered. Then he saw an aviator. He felt the lure of the air and answered the call. He tried to enlist in the Moisant school. Owing to his size and weight he did not receive much encouragement. Then he went to Curtiss, but the aviators at that training ground told him that the chances were against him. At last he applied to the Wrights. They took him in charge. On his third lesson he lifted his machine off the ground and made a complete turn. He earned his brevet in a few weeks. Within a month he had his pilot's license. Mitchell was daring but cautious. He loved his big Wright machine as if it were something human. He owned two of them, but the one in which he flew was his pride. Every metal part was kept burnished, every wire was in the best of condition; his motor seldom went wrong. A great deal of this care was due to his companion, "Wild Bill" Heth, who at times acted as Mitchell's mechanician. Heth is one of the best motor experts in this country. He saw Mitchell fall yesterday. Mitchell had many close calls. One of them was at Gulfport, Miss., last winter. At that time his machine was completely demolished. George C. Johnson, special representative of the Moisant International aviators, was at that time contracting agent for Mitchell. He saw the aviator fall. "You can say what you please, but his escape at that time was miraculous," said Johnson last night. "Another such fall would have surely killed any other aviator." 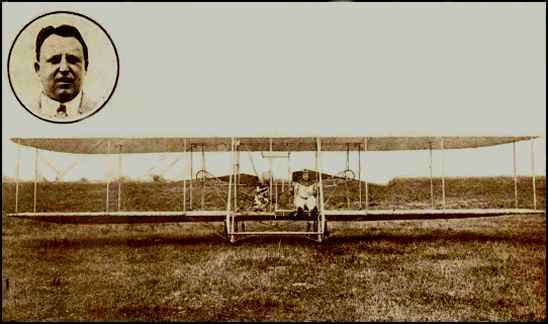 Mitchell flew in Memphis on two occasions and for a while utilized the driving park as a training ground. He carried many passengers on his flights here and seemed to delight in giving them aerial thrills. One of them was Miss Marguerite Champlain of 267 East Lucerne place, whom he took for a few minutes spin one evening. As a ride, he was opposed to carrying women passengers and would take them only a short distance up when there was almost no danger. Mitchell did not believe in reckless flying. His spirals were pretty and daring, but he had them down to perfection - or as near perfection as an aviator can. Mitchell was married. He had no children. Waits in Vain for Dead Master, Louis Mitchell. Will be His Last Resting Place. Transcribed by Bob Davis - 9-4-05 Montgomery, Ala., Oct. 23. - Aviator Louis Mitchell, who was killed when his aeroplane fell 250 feet Wednesday after noon at the state exposition, will be buried at Camden, Ark., his boyhood home. The body was shipped to the Arkansas city by a local undertaker yesterday evening. Mrs. Mitchell, who has been with her husband here, accompanied the remains. She is grief stricken over her husband's death and is under the care of a physician. Mitchell had promised his wife that he would retire from the aviation business the latter part of the year, and his exhibition here was to have been his last appearance as an aviator. The aviator's pet bull dog Joe kept an all night vigil for Mitchell Wednesday evening. He had been trained to greet his master as soon as he descended from a flight, and when his aeroplane fell and ploughed into a cotton field several hundred feet from the fair grounds, the dog started toward the place. He was barred by a big fence and was forced to return to the American Aviator Company's private car. There he stationed himself near a window, watched every person who entered the car and whined piteously for the return of his master. Eugene Heth, Mitchell's partner, continued his flights Thursday afternoon but did not attempt to make the sensational spiral glides that caused Mitchell's death. Heth believes the aeroplane accident was caused by the machine dropping into an air pocket or eddy. Mrs. Mitchell watched her husband with a pair of field glasses and saw the machine waver and then turn topsy turvy before falling to the ground. ONLINE RESOURCES If you search for "Louis Mitchell", using the Google search engine, (11-9-07), you will find about 120 links. If you are really diligent, and have the time, you can learn a little more about this aviator. Of special interest is the site cited below. Louis Mitchell You will find a brief biography and several views of his burial place on this page of the Find-A-Grave website. The photographs can be enlarged by clicking on them We should thank Connie Nisinger for making this information available to our online community. You can access the page by clicking on the title.